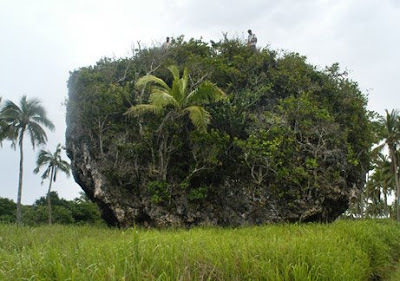 Huge coral boulders on Tonga's main island of Tongatapu were possibly tossed hundreds of feet inland by one of the largest tsunamis ever triggered by a volcano. Researchers believe the ancient wave may have hit the island's shore sometime within the past 7,000 years, after the melting of the most recent ice age brought sea levels to roughly where they are today. The largest of the seven boulders is 50 feet (15 meters) wide and estimated to weigh 1,600 tons. It currently sits more than 300 feet (100 meters) from the sea and 30 feet (10 meters) above sea level, an anomaly on the South Pacific island's flat landscape. "We suspect that this may be the largest [object] moved uphill by a tsunami," said Cliff Frohlich, a senior scientist at the Institute for Geophysics at the University of Texas at Austin. "It wasn't like we found these rocks everywhere in Tonga," Frohlich noted. "We found them just in one place on one island." By comparison, the 130-foot (40-meter) waves triggered by the 1883 eruption of the Indonesian volcano Krakatau—the most powerful explosion in recorded history—are known to have moved a boulder only about a third that size the same distance, Frohlich said. It's possible there simply were no larger boulders for that tsunami to displace, he added. But he and his colleagues believe the Tonga tsunami may have been as big or larger than Krakatau's. The team will be presenting some of its findings at a geology conference in Houston on October 5. Their study is currently under peer review. President Putin says NATO’s expansion eastwards is a direct threat to Russia’s security. He made the comment after talks between Moscow and NATO broke up without agreement in Romania. One of the major sticking points is NATO’s support for a U.S. anti-missile defence system in Europe. Go read. Very interesting: joining NATO would "sacrifice part of our sovereignty to create the illusion of increasing our security." I wonder what the French would say to that! Arriving at that understanding took some time. Laboratory technicians spent years cleaning and CT-scanning the bones, which were embedded in hard rock, to finally reveal the evidence of air sacs within Aerosteon's body cavity. Previously, paleontologists had found only tantalizing evidence in the backbone, outside the cavity with the lungs. When are we going to get the Theropod Vertebra of the Week blog? EXTINCT theropod, please. Especially since I hope to use them and their Falcon 9 LTC variant launch vehicle in the future. The European Union wants to become a major player in space projects, EU ministers agreed Friday, amid concerns that member states and industry are unwilling to provide the astronomical costs involved. The EU ministers agreed on "the need to develop instruments and financial schemes for European space policy," announced French Research Minister Valerie Pecresse, whose country holds the EU's rotating presidency. However a statement issued after the ministerial meeting gave no details on the funding needs or means, highlighting the problem. The 27 EU ministers in charge of space and research just stressed "the need to find long-term financing for space infrastructures, particularly in the field of observation". The EU is currently developing two headline space projects; the Galileo system for satellite navigation and Copernicus which will use satellites to monitor the environment. So far the community budget has earmarked 1.2 billion euros for 2007-2013 for the development phases of Copernicus, with none yet budgeted for its subsequent operation. The much-delayed Galileo project was finally given the green light in April with a 3.4 billion euro budget up to 2013 scraped together from unused farm funding. The space war is raging with some member states wanting to cut the community spending and not prepared to give space exploration its own budget, an EU source said. "We are not in a position to send people into space or to bring back material which we launch. We have to ask for help from the Russians," said Verheugen. "The question is; do we want to remain dependent or are we capable of making a collective effort to become independent?" he asked member states. Interesting contrast with China there. The US...we're kinda unique. An enigmatic dicynodont specimen from Tweefontein in Graaff-Reinet, South Africa, represents a new species of the Middle to Late Permian genus Emydops, E. oweni. Taxonomic revision of the genus reveals that, of the thirteen previously described species, only E. arctatus is valid. The holotype of E. oweni, SAM-PK-3721 is unusual in that it bears two tusks on each side of the skull, a symmetrically developed double-tusked condition being a very rare if not unique case in the dicynodont fossil record. The possible pathological causes for this occurrence are discussed and the production of the supernumerary teeth by mutation is considered to be the most likely explanation. Phylogenetic analysis supports the sister-taxon relationship of the two species of Emydops and their position at the base of Emydopidae. Emydops oweni shares a number of derived characters with E. arctatus, including its small size, wide temporal region, prominent lateral dentary shelf, embayment on the medial surface of the palatal rim, and squared-off profile of occiput. In addition to its aberrant dentition, SAM-PK-3721 can be distinguished from the type species by a number of autapomorphies, including the absence of the small maxillary foramen lateral to the postcaniniform keel, the presence of a distinct ventrolaterally projecting pterygoid flange, and the diagnostic shape of the lateral dentary shelf. The identification of two additional tuskless specimens referable to the new species excludes the possibility that the autapomorphic characters are associated with the double-tusked condition, allowing us to conclude that E. oweni has both tusked and tuskless morphs. Dicynodont therapsids were cosmopolitan members of Middle and Late Permian terrestrial ecosystems. Despite occurring in nearly all places where tetrapod fossils of these ages are found, it is unclear whether any individual dicynodont species ever achieved a Pangaean distribution, with populations located in both Gondwana and Laurasia. Diictodon feliceps (Owen, 1876) is perhaps the best candidate for a species with such a broad distribution, but this depends on whether D. tienshanensis (Sun, 1973) from the Junggur Basin of China is a valid species. We use qualitative morphological characters, as well as linear measurement- and landmark-based morphometric techniques, to demonstrate that IVPP V.3260 (the type and only known specimen of D. tienshanensis) falls well within the range of variation displayed by D. feliceps, implying that D. tienshanensis is not a valid species. The occurrence of D. feliceps in China poses a biogeographic puzzle, since this species is otherwise known only from southern Africa. We predict that D. feliceps will be discovered in areas between southern Africa and China. However, if its absence persists in the face of continued exploration and collecting efforts, it may imply that a dispersal route and/or intervening populations of D. feliceps existed in areas in which an Upper Permian terrestrial fossil record was not preserved. Finally, if dicynodonts were adapted to exploiting components of the Gondwanan flora, the presence of D. feliceps in Gondwana and Laurasia indicates that such trophic interactions were not an insurmountable barrier to their dispersal. Sweetness. Anything Permian Therapsid-ish is tres kewl as far as I am concerned. Link above! Heterodontosaurs are one clade I find really fascinating simply because they seem so different than the other dinos. No Good Will Come of This! The Foreign Ministry says pirates have seized a Ukrainian-operated ship off Somalia. The ministry says the Faina was sailing with 21 people on board under the Belize flag, though it is operated by Ukrainian managing company Tomax Team Inc. The ministry says in a statement that the ship's captain reported being surrounded by three boats of armed men Thursday afternoon. The ship's passengers include 17 Ukrainian citizens including the captain, as well as three Russians and one Latvian citizen. The ministry had no information on the ship's cargo. But the Interfax news agency cited an unnamed source as saying the ship was loaded with about 30 T-72 tanks and spare parts for them. Oh shibbit...with a blink tag. Most striking is that, despite years of effort, carbon dioxide emissions are increasing at an alarming rate of 3.5% a year– faster than the 2.7% predicted by the IPCC in their worst case scenario, and miles ahead of the 0.9% annual rise in the 1990s. Worst still, current measures have been based on a middle-ground IPCC scenario. Pep Candell from the Global Carbon Budget told me that this was “astonishing”. For the first time, we have hit 10 billion tonnes of carbon emitted annually. The other thing to note is that China and India are galumphing their way up the table of biggest carbon dioxide emitters. Ten years ago the top four were: USA, China, Russia, Japan. Today that list reads: China, USA, Russia, India – and I am assured by Candell that next year India will have jumped into third place. This is a worry – when the Kyoto Protocol was first talked about, the countries of the developing world were overwhelmingly the highest emitters of CO2. But in the meantime, whilst decisions were made, details argued out and paperwork signed, the developing world has taken pole position. China has, since 2002, jumped from being responsible for 14% of the global carbon dioxide emissions, to 21%. At the same time the US has been hovering at around 20%. Oh, yes, global warming is inevitable. Actually, neither statement is correct: I'm being flippant. There's a lot more going on (less snow, more rain, a lot more catastrophic rain, etc) than merely the climate zones marching north some 300 odd miles. It's much more of a fundamental climate change than a climate latitudinal shift. No, it won't be a repeat of a past climate despite my flip comments (also) to the effect that we're headed to a Neo-Eocene. It's going to be something completely new. And exciting. And without the extinction of humanity. Sheesh. I have been without alternate history discussion forum since I abandoned SHWI. The various dotcom equivalents or near equivalents haven't been as appealing: their culture's are just not rigorous enough for me. *sighs*While Epylium Aurelia has passed the 150 page mark and Zach, Scott, and I have been plodding along with our alternate Permian discussions. its not satisfying as far scratching the itch as far as the different history books I read and spinning out something each time. There were several points in the book about Byzantium and the Crusades that could ahve been spun out as WIs. There are so many that its dizzying in the book on Mexico I am reading now. There have been others in the past. There will definitely be more in the future: I am considering two more books on Byzantium, the Crusades, and Arabs, a history of the Persian Empire, and about the Caste War. Each of these are fertile ground. Ahem. Global Warming is Inevitable. China successfully launched its third manned spacecraft on Thursday with three astronauts on board to attempt the country's first-ever space walk. 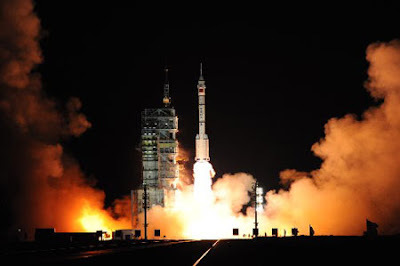 The spaceship Shenzhou-7 blasted off on a Long March II-F carrier rocket from the Jiuquan Satellite Launch Center in the northwestern Gansu Province at 9:10 p.m. after a breathtaking countdown to another milestone on China's space journey. Onboard pilots Zhai Zhigang, Liu Boming and Jing Haipeng are expected to orbit the earth for three days, when one of them will float out of the cabin about 343 kilometers above the earth. When they make it, China will become the third country in the world who is able to conduct extravehicular activity (EVA) in space following the former Soviet Union and the United States. It'd be nice to see another source for the information. Methane is a far more dangerous greenhouse gas than carbon dioxide is...however, it doesn't last nearly as long. I found this while googling for something else. I was under the impression that anapsids were no longer considered basal most due to some dna testing found that turtles are derived diapsids. What that does to the other anapsids place in the world, IDK. In fact, many books/papers I have read have brought that up making it sound as though there are exceedingly few Permian anapsid specialists. Anyone really know? Can We Forgive Dixon's _New Dinosaurs_ Even More? An unusual breed of dinosaur that was the size of a chicken, ran on two legs and scoured the ancient forest floor for termites is the smallest dinosaur species found in North America, according to a University of Calgary researcher who analyzed bones found during the excavation of an ancient bone bed near Red Deer, Alberta. "These are bizarre animals. They have long and slender legs, stumpy arms with huge claws and tweezer-like jaws. They look like an animal created by Dr. Seuss," said Nick Longrich, a paleontology research associate in the Department of Biological Sciences. "This appears to be the smallest dinosaur yet discovered in North America." Called Albertonykus borealis, the slender bird-like creature is a new member of the family Alvarezsauridae and is one of only a few such fossils found outside of South America and Asia. In a paper published in the current issue of the journal Cretaceous Research, Longrich and University of Alberta paleontologist Philip Currie describe the specimen and explain how it it likely specialized in consuming termites by using its small but powerful forelimbs to tear into logs. "Proportionately, the forelimbs are shorter than in a Tyrannosaurus but they are powerfully-built, so they seem to have served a purpose," Longrich said. "They are built for digging but too short to burrow, so we think they may have been used to rip open log in search of insects." Longrich studied 70 million-year-old bones that were collected on a dig led by Currie at Dry Island Buffalo Jump Provincial Park in 2002 where the remains of more than 20 Albertosaurus sarcophagus individuals were found. Albertosaurs are a type of tyrannosaur. The bones were placed in storage at the Royal Tyrrell Museum and Longrich came across them while trying to compare Albertosaurus claws to another dinosaur species. Wow. Dixon may need even more forgiveness than Darren has given him for his book, The New Dinosaurs. Disturbed yet, Zach? 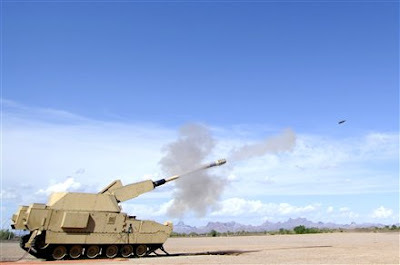 Future Combat Systems program managers announced today that its much-touted Manned Ground Vehicle (MGV) Non-Line-of-Sight Cannon (NLOS-C) Prototype successfully fired its first artillery projectile. Contrast with the crew of 8 that the current American SPH has. It's much smaller too. However, it still doesn't fire on the move though. We have a change of venue. Holloman had some testing that trumped us. This will cause a delay. From our POV since we've been having manufacturing issues, this is a good thing. However, some of the other teams are having serious issues with conflicting schedules if it slips. It will slip: that's a given at this point. It's only a question of for how long. No matter what, it has to happen before March in NM due to the winds. Or in mid to late May. We'll see what it is. The Collective Security Treaty Organization (CSTO), long regarded by Western military experts as something of a “paper tiger,” will become increasingly active in Central Asia as Russia’s President Medvedev presses for the militarization of the organization. CSTO General Secretary Nikolay Bordyuzha has referred to the creation of “‘a powerful military grouping of five countries in Central Asia.” This may include up to 10,000 personnel, apparently tasked with responding to external threats to the region; but the timing of the announcement, after the war in Georgia and as Russia’s relations with the West continue to be strained, suggests that Moscow is also trying to convey a “signal” to NATO over the region that in the current political climate, however, may be easily misconstrued. The 27,000-strong Georgian military is a 40th the size of the Russian military of over one million. Only several thousand solders from each side were directly involved in the war last month, which lasted three days before the Georgian forces were ordered to withdraw. Russia emerged victorious, taking full control of the Georgian breakaway regions of Abkhazia and South Ossetia; but this short war revealed serious deficiencies in the arming, training, and battle readiness of the Russian military. Last week at a special meeting in the Kremlin on military development, President Dmitry Medvedev announced that new weapons would be procured and developed and soldiers’ pay and battle readiness increased. "We need modern, effective armed forces ...because of recent problems, including Georgia’s aggression and its continued militarization," Medvedev announced. "This is the highest state priority in the coming years." The Russian military did not have a single spy drone in the sky, did not know for certain where the enemy was, and could not use precision weapons effectively. Until the Georgians retreated, Russian forces could not suppress Georgian artillery. The Russian Air Force did not manage to provide effective battlefield air support or reliable intelligence information because of Georgian anti-aircraft fire that shot down, according to Russian sources, seven bombers, including a strategic Tu-22M3 Backfire. According to the military, the Georgians used Buk-M1 anti-aircraft missiles, obtained from Ukraine (Vedomosti, September 12). The Russian generals are making no secret of the shortfalls and problems their forces encountered during the invasion of Georgia, apparently hoping that this will help lobby for increases in defense spending. The tactic seems to have been at least partially successful. Prime Minister Vladimir Putin has announced substantial spending increases for 2009. Defense spending is planned at $50 billion, an increase of 27 percent over 2008. National security spending in 2009 will be $43 billion, an increase of 32 percent over 2008. National security includes the budgets of Russia's federal law enforcement, Interior Ministry forces, and intelligence services—the former KGB (Interfax, September 16). The increases in spending are substantial, but will they help refurbish the military? In 2000 when Putin came to power, defense spending was $5 billion and has grown by some 10 times since then, but the solders who invaded Georgia were armed exclusively with old weapons of Soviet stock, produced in the 1970s or 1980s. Fortunately for them, the Georgians were also armed mostly with the same equipment. Some Georgian weapons were partially modernized, but the Russians outnumbered and outgunned them. Experts express doubts that the increase in defense spending will result in a major modernization of the military and predict that the money may be misappropriated (Nezavisimaya Gazeta, September 15). The Russian defense industry today is in a crisis, its technology outdated, its well-trained workforce old and shrinking, and its capability to make new weapons withered away. That's just it. The rest of the world moved on. $TECH has incremented a few times since the fall of the soviet union in 1991 - 17 (!) years ago. The Russian forces in Georgia were using largely unupgraded equipment from the 1970s rather than that from the 1980s. They were using some of their "best" pilots and theater level bombers that they had for recon. And they still had it shot down. By Georgia. Georgia! Any new Russian miltech is not a threat. Russia has far more to fear through its actions than be feared. Except if you happen to be an xUSSR republic. Then there's some fear involved. If the West were to give guarantees, let the Ukrainians or whomever into NATO, or just plain old rapidly upgrade their military, the Russians would be a toothless bear. In fact, that would be a good idea no matter what. Don't make them buy the kit, gift it and the training: it'd bring them in line with NATO standards anyways. That's really an interesting idea. German Leopards, French Rafale, British Warriors (? ), and what have you over five years. A modernized Ukrainian army would be a force to be wary of for the Russians. Rocket news soon. On the concall and I want to give the X Prize Foundation to get their news release out first. Boggle. I'll link when they have it up. My neighbor died two weeks ago. I need a break again from all things HPC and rocketry related. So, I am going to bang out over the next few days a post on the paleoecology of the Carboniferous. This is related to the post on carbon cycling and was intended to be a second half of it. I ran out of time and had to split the effort into two posts. This is the second post. There is an online friend that I keep mentioning that really deserves the credit for what I am about to write. Carlos made a comment on his old blog, Halfway Down the Danube, when he did a paleo ecology post about how the Paleozoic ecology was pretty segregated and could be interpreted as a caste system for those of us a little more familiar with the historical and cultural studies. This was a while back as I was just getting back into my paleo interests once again and it has really, really stuck with me. It fits so well with what I keep encountering time and again. Carlos has since passed on from the blogosphere, alas, but this post is a hat tip to him and his polymathism. The world we live in is quite old. I mean that literally and figuratively. The world is billions of years old, somewhere around its 4.5 (+/-) billionth year: after all, who keeps counting after a while? However, I also mean this in terms of what has transpire in the 600, 650 billion years of multicellular life's evolution. There are times when it seems we live in an advanced and fastening world with a lot of highly developed complexity that often gets portrayed as the triumphant, overdetermined end result of all that evolution. We like to look back at the past and proclaim our superiority. A false superiority. Alternately, our modern ecosystems are sometimes portrayed as an impoverished place with ossified lifeforms with little chance for change and are relatively soon doomed by either Man or some devastating environmental catastrophe. The vast gaps of diversity from what has gone extinct can seem pretty depressing at times and not just the recent 6th mass extinction victims either. The truth is neither is really an accurate picture. If past is truly a different place, Deep Time is an alien world. We touched on that in some of the simulations of the paleoclimate, especially in the Permian Extinction time frame. We talked about it in the previous post on the Carboniferous carbon cycling (or lack there-of). I have pondered the Mesozoic and its rather different and diverse organization of its ecology. As strange as the Mesozoic ecology was the Paleozoic ecology was truly different. The Carboniferous Period epitomizes this. When Carlos talked about the Paleozoic ecosystem as being a caste system, he meant that different groups of animals and plants lived and did specific things and only their close relatives did anything similar. Bob and his kin are the warriors. Nadya and hers are the priest(esse)s. Hiro and his are the peasants. Tomas and his are the aristocracy. However, instead of social roles being set, in the natural environment, the plants and animals were 'niched out' this way. This was especially true for plants. Plants originally invaded the terrestrial environment in the Ordovician Period before 470 million years ago. That's when we have evidence of the first land plant spores from the fossil record. While terrestrial plant evolution would cotinue to allow plants to adapt for some time from the Ordovician through the Silurian, it was in the Devonian that the major diversification took place. This is when vascular plants seem to have broken off into their four major groups. We'll get to them. However, the timing of that diversification is interesting. Wignall and Hallam referred to the Devonian as "one damned thing after another" in their volume, Mass Extinctions and Their Aftermath. There were major mass extinctions that often get lumped together into the Late Devonian Mass Extinction (or here). In the marine environment the extinctions blotted out the placoderms most famously and in the terrestrial environment seem to produce a possibly complete wipe out of the early terrestrial tetrapods. This is often referred to as Romer's Gap. Whether this is a sampling artifact or not, remains to be seen, but for the moment, it does appear that there is an interesting and possibly, even probably if its not a sampling issue, tied to the mass extinctions in the Late Devonian. While this was going on, the plants were busy bushy-ing the family tree. Speciation often requires isolation. Recently, especially, mass extinctions have been tied to diversification, as contrary as that may be to most people's thought processes. If the mass extinctions of the Devonian sufficiently isolated the different plant populations, it is possible, even probable that the populations would have started diverging. A lot. As the isolated plant populations faced different environments, their favored adaptations would have produced some really different planforms. One of those is what we think of as a tree. DiMichele, Stein and Bateman in Ecological Sorting of Vascular Plants During the Paleozoic Radiation that there are, based on their cladistic analysis, produced a classic branching tree for the interrelatedness of the plant kingdom. They give quite a long explanation, including a detailed reasoning and weighting of the characters for their analysis. I'll give a quick summary of their phylogeny, but this is only meant as background. It appears that all terrestrial vascular plants are divided in one of two groups, the zosterphylls and the trimerophytes. The majority of vascular plants we know today - apple trees, ferns, and what have you - are all trimerophytes. 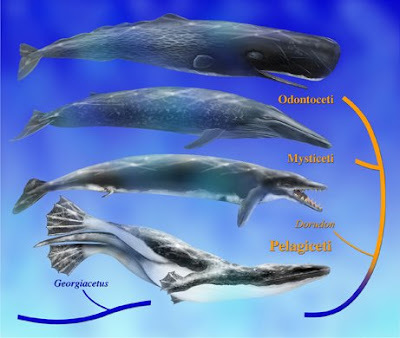 During the Carboniferous, three out of four of the dominant groups were trimerophytes. 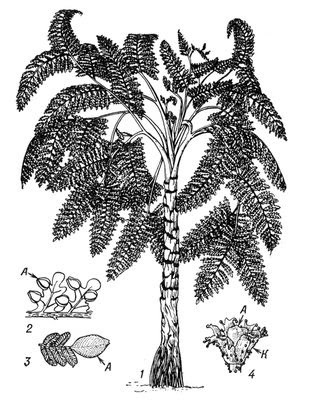 Only one was not.During the Carboniferous, three out of four of the dominant groups were trimerophytes: ferns, sphenopsids, and seed plants. Only one was not, lycopsids. Each of these plants castes lived primarily in different environments. That is to say that they did not live in each other's environments, but rather that they became the primary, sometimes nearly sole, plant group in that environment. Sometimes, btw, it seems that a particular group actually originated somewhere else, remained a bit player there, and then spread, preadapted, to their environment where they ended up dominating. During the Carboniferous, there were three major environmental dominions: marshes and swamps, aggragational environments other than marshes (ie flood plains), and upland. Each one of these had a different caste that ran the place. Then there was a fourth caste that came in and set up shop whenever there was an opening. This one evolved to fill the role of opportunist that would move in whenever the environment was disturbed. 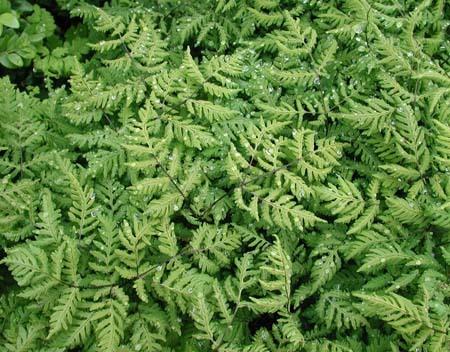 That caste was the ferns. They developed with the sole role of rapidly filling in wherever was so disturbed that the other castes were wiped out by an event. 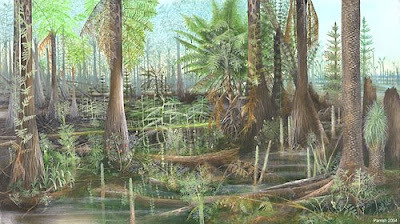 During the Carboniferous, as we all know, the oxygen content of the atmosphere was far, far in excess of modern times. Fires were quite, quite common. Other localized catastrophes were also not uncommon as well. When you put that altogether, it presents a unique selective pressure that some plant would be able to take advantage of. Ferns did exactly that. That was their original niche. That isn't what they developed into later on - tree ferns developed after mass extinction opportunities - though some varieties did continue to do that. In fact, the very famous Fern Spike is a good example, albeit on a massive scale, of that exact niche strategy on a massive scale. So what did the regular, normally populated phytocaste domains that existed at the time? 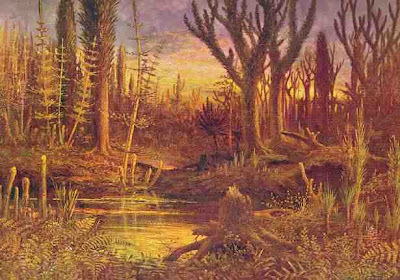 When most people think of the Carboniferous, they think of the grand swamps and marshes and great, great sodden forests. Water is ever present. It's sluggish and frequently standing. It would remind you of a mangrove swamp in some ways and in others just a plain old nasty swamp or marsh. This was only one of the kinds of environments that were present at the time. It was a very, very important one to be sure though and its dominant caste was that of the lycopsids. What's a lycopsid? A lycopsid is an interesting type of plant. It's a radically different from most modern seed plants in a few particular ways. The structural element, that what keeps the plant upright and vertical, is actually the bark. This is really different than our modern trees which use the wood as the structural element. It also is one of the reasons that you often see in different renditions of the Carboniferous have these odd, strange hollow logs. Those are lycopsid logs that the center, softer 'wood' has rotted away leaving the structural skeleton. The other interesting fact about them is that they did not - do not! - have leaves. They grew to be tree sized and for the marshes, swamps and mangrove forest niches that's precisely what they were. The reason that they were restricted to only the swampish environment was two fold. One was because they still required water to reproduce. The second was that their root system is not that deep or advanced enough to tackle dry ground terribly well. While in the Carboniferous they were the swamp forest trees, today they are represented by the extent club moss. Note: the lycopsids of the Carboniferous were not merely amped up, oversized club mosses: club mosses have evolved for 300+ million years since then and they are very, very distant relatives as a result. The next phytocaste domain happens to be aggradational environments. Wuh? This is an environment that deposition of sediment is faster than being washed away or settling. Swamps are a classic case of this, but those are explicitly separate from this in the Carboniferous. This dominion was anything but a swamp where deposition was faster. A good, good example of this is a flood plain. In this case, if you were to walk out from the swamps, marshes and sluggish water forests onto the flood plains where there was far more drainage, but still had relatively ready access to water you would find that the lycopsids had given way to another caste. This caste was the sphenopsids. In this case of Carboniferous, the sphenopsids produced many different forms. They had stream side forms like modern ones. They also even produced shrub sized ones. They even produced the flood plain forest "trees." The sphenopsids dominated the nonmarsh, non-upland environments. They were ubiquitous: they were the forest largely from bottom to top. The question is "What's a sphenopsid?" Sphenopsids have an extent representative: the horsetail. However, like the club moss, remember that the modern horsetail is not the same as the Carboniferous sphenopsids for the same reasons. 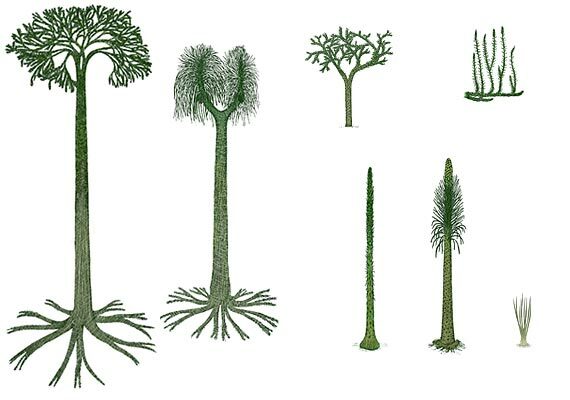 However, like the modern horsetail, the Deep Time sphenopsids grew in segments, even the tree sized ones. They also had a rhizome that the roots branch off from that. Like the modern horsetail it also had a structural exterior and weaker pith, similar to a lycopsid. As far as we can tell, the ancient sphenopsids had a similar reproductive cycle similar to their modern relatives. Again, there are no leaves. There are several differences though. The final environmental dominion that we haven't discussed as yet is the upland environment. This is where the chance for water is greatly reduced and the soil is frequently and mostly dried out. The climate is frequently harsher and unfriendly. As you would expect, the seed plants dominated here. It should be noted, though, that seed plants did not originate in the uplands. They apparently, according to DiMichele et al, had a long evolutionary history in the lycopsid domain as a bit player before they developed for whatever reason the seeds that allowed them to strike out to colonize what had been a largely untapped region. They would very quickly diversify in that environment. As a consequence, btw, they had a far, far greater diversity in forms as a consequence as a side effect of the relative marginal nature of their domain. Seed plants wouldn't make almost any headway until the climatic changes of the Permian towards making inroads on the other plants' dominions. They probably would not have even come to dominate the plant dominions like they do now without the multiple intervening mass extinctions. If they did not have the intervening mass extinctions hadn't taken place, there's no indication that the seed plants would have come to dominate the lycopsid and sphenopsid dominions. As an aside, DiMichele et al, make an interesting assertion. I am not really qualified to comment, but apparently there was some consternation on their part about the angiosperm - flowering plant - classification. They argue very, very strongly that it is an accident of history that the angiosperms were classified as a phylum, but in reality they feel that it belongs as a class, a very species rich one to be sure, but not nearly as high up in the Linnean hierarchy as they get. They are merely a very successful seed plant clade as far as the authors are concerned. Slogging through the swampland forest, you really wish you hadn't been talked into ditching the boat. You're about halfway out now and you've seen a few critters that really, really made you wish you'd stayed in the boat. Scaly salamander-like tetrapods that were the size of crocodiles. Eels that came up to gulp air. Giant sized bugs. oy. What's really fastinating and creepy at the same time is the trees. No leaves. Zilch. They make you think of thorn bushes grown into trees with no leaves and photosynthetic spikes. There are logs floating in the water that are, well, hollow and look more like organic pipes. The only reassuring element is the common and familiar looking ferns that seem to be skulking waiting for some break in the local defenses. Ah here we are. Finally! You're out of the swamp and moving inland. There seems to be something of a flat plain, a with better drainage. It's beautiful in its own strange way but you're watching your step. There are cat sized spiders running around that make the tarantulas back home seem tame dachshunds in comparison. There are also plenty of what look like slightly misshapen lizards and more of those scaly salamanders as well. There are giant millipedes...sorta...too. The forest seems more like something from your own time...but only if you were ant sized. The trees look like wildly contorted horsetails. It almost feels as though you ate the wrong side of the mushroom and that you ought to expect to see a white rabbit with a pocket watch at any time. Even here, the ferns seem to lurk in corners awaiting some violence upon the order of things. At last, some hours later, you find the ground moving upwards. You're moving into the hills. The vegetation changes again. Now though, its looking more like home. The plants actually have what appears to be leaves and needles. There are actually seeds on the ground. It's not home, or even close, but it feels a little less alien. Besides, those freaky salamanders are gone. Yep, those criminal ferns seem to be here, too. You spend a lot of time climbing, but you do reach a vista and look out. What you see is different. It's odd. You see a world where the forests do transition but each area looks really different and they sit almost atop one another. In some ways it looks like a bulls eye. Its rings of vegetation with very different if blurred textures. In the lowest, swampiest areas you see the lycopsids with their spiky looking branches. Then the strange fractal, brobdingnagian horsetails. Then in the mountains around you, the seed plants that don't seem quite right. Then you see off in the distance, there's a hillside that looks a like it has some blackened trees and there in the wind you see the greenery dance almost grass like, but you know its not. Its those ferns. They're ariot with growth in an area recently savaged by fire. You can't help but note. This world is segregated. Far, far more than your own with its blend of this and that. This world, and its plants, all have their place and from that place, unless you are of the fern-ish underworld, you do not move. Its a caste ecology. Almost set in stone. It would probably ossify if not for a major shake up. One you know with dread-relish is coming. You had best be moving on, there's not a lot to eat unless you like gamy, wild reptile meat or roasted bugs. Your digestive system just didn't evolve in this world. It's not home and it won't be home, not for 300 million years. I would like to make a note that the interconnectedness of these different phytocastes was pretty low. Each had a very different ecology, even if they were side by side. They just. didn't. mix. The diversity of the lycopsids was actually pretty low, btw. It also contributed to their demise as megaflora when the extinctions came. At any rate, I am out of time and I have Team Phoenicia work to get done tonight and tomorrow (visitors! ), so we'll have to end it there. I hope you enjoyed the little tour and I hope I didn't embarass Carlos too much with this. Fire away with any screwups, thoughts and comments, as always! Actually, I may append this later. A team of scientists from the U.S. Department of Energy's Idaho National Laboratory earlier this month reached a major milestone with the successful production of hydrogen through High-Temperature Electrolysis (HTE). The milestone was reached when the Integrated Laboratory Scale experiment started producing hydrogen at a rate of 5.6 cubic meters per hour. The achievement was recognized at a media event in Idaho Falls Sept. 18. 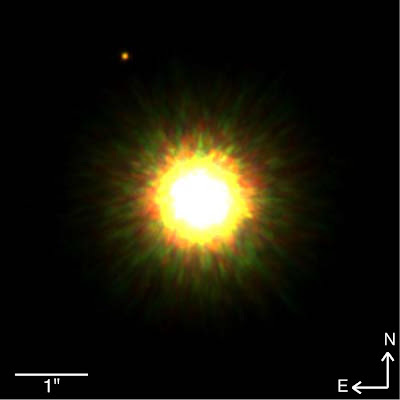 "This is by far the biggest achievement we've had," said Carl Stoots, the experiment's principal investigator. High-Temperature Electrolysis is a system of producing hydrogen very efficiently by using technology originally developed for solid oxide fuel cells. HTE is a significant improvement over the more conventional methods to produce hydrogen. HTE uses an electric current through water to separate it into hydrogen and oxygen. Combined with a clean power source such as a next-generation nuclear plant, HTE could produce hydrogen at 45 to 55 percent efficiency. Some idle thoughts. I wonder what the drawbacks would be to attach this sort of set-up to most of our nuclear reactors would be? 5.6 cubic meters/hour is not that impressive, but it is a scale up from the previous lab tests. I wonder what the limits are? Was the Paleocene Mammalian Megafauna Placental? In light of the findings of Wible et al. (2007), we might even doubt whether many of the Palaeocene eutherians even represent placentals. 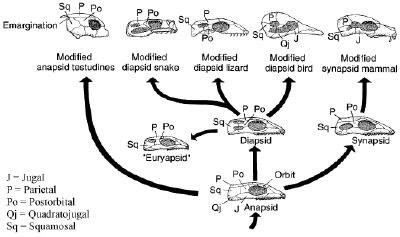 The classification of McKenna and Bell (1997) united many early eutherians such as Cimolestidae, Pantodonta and Taeniodonta (as well as the modern pangolins) into a group called Cimolesta, which was then included in the Ferae with creodonts and Carnivora. While pangolins may indeed be related to carnivorans, Cimolestidae, as referred to above, are not even placentals. What then becomes of the rest of the "Cimolesta"? Are they also stem-eutherians like Cimolestidae, or are they true placentals? Such questions are not mere curiosities - the answer could have significant effects on our understanding of Palaeocene ecology. Go read. That chunk makes my head spin a bit. It would intuitively explain a whole lot differences between the pre-eocene ecological players and the modern ones. Wow. Consider this a call-out, Chris, to expand on that theme. Tell us more! Let me state this is my opinion and only my opinion NERSC does not necessarily agree with me. Frankly, IDK what they think on the matter. This is NOT a supercomputer. 64 cores is around 16 processors. Once this would have been a supercomputer, like when I first got involved back in the early 90s. 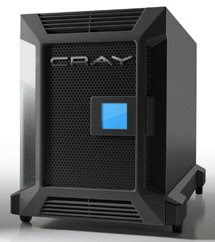 Nowadays when the fastest machines have 38k+ cores, 64 is nada. STOP with the inane marketing, folks. I really, really mean: JUST STOP! You're embarrassing yourselves. HPC is a moving target and this, this "supercomputer" picture above is a server and nothing more. That's the devonian, but its tres important to what I am going to put up tomorrow. Perhaps We Should Call Them Bellicussia! Russia triggered a fresh scramble for the oil wealth of the Arctic yesterday after President Dmitri Medvedev called on security chiefs to establish a formal border in the region. Mr Medvedev laid claim to a vast tranche of the Arctic, telling his National Security Council that it had "strategic importance" for Russia. Estimates suggest that the polar region contains billions of tons of oil and gas reserves, which are increasingly accessible as global warming melts the ice cap. "We must wrap up all the formalities for drawing the external border in the continental shelf. This is our direct responsibility to future generations," Mr Medvedev told the Kremlin meeting. Nikolai Patrushev, the director of the security council, said that Russia would defend its interests in the Arctic against rival claims from the United States, Canada, Norway and Denmark. When viewed through the side lighting of the Russo-Georgian War, the fact they are now handing out passports in Simferopol and Sevastopol just like they did a year or so ago in Ossetia, they are flying bomber patrols near the US and Europe (probably Japan too) again, the warning Moldova not to make the same mistake as Georgia wrt Transnistria, and flying two of its remaining nuclear bombers to Venezuela, it sure sounds like Russia wants the Cold War so much more than the US does. Oh, yes, it wants to build a space center in Cuba too. 1. Let's see if this spreads to more than Crimea. Places to watch are Donetsk and Odessa. If I hear something first, I'll be sure to post it. 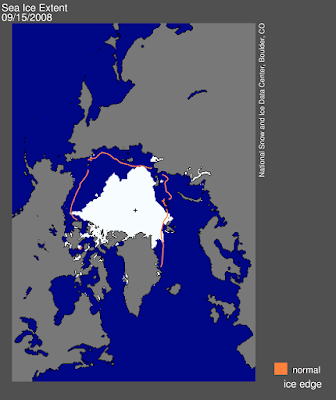 The Arctic sea ice cover appears to have reached its minimum extent for the year, the second-lowest extent recorded since the dawn of the satellite era. While above the record minimum set on September 16, 2007, this year further reinforces the strong negative trend in summertime ice extent observed over the past thirty years. With the minimum behind us, we will continue to analyze ice conditions as we head into the crucial period of the ice growth season during the months to come. It is not as bad as last year, but still really not good. Next year ought to be interesting as tp whether or not we see trending away from the minimum of Sept 2007 or further melts. Probably the latter. 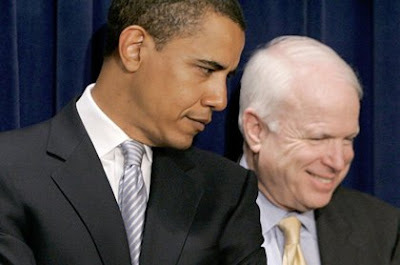 Why isn't Obama just smacking McCain around like a little...ahem? I mean, the economy is going bonkers. We have a war that we are still in that he has promised to draw to a close. We have another war that we are slipping up in and...we have the single most unpopular President in decades, if not ever, in office. Not to mention he's far more articulate than McCain is on the stump. Why does it seem that the whole election is really a toss up? With the pronunciations of a landslide prior, I'm wondering: what the heck is up? Is the Russian Army is Worse Than I Thought? A few months ago the European Command conducted a training event called "Immediate Response 2008," involving roughly one thousand Soldiers and Marines. The news was barely noticed, and I suspect even the European Command forgot about the whole thing. Ho-hum, just one more exercise. After all, we do these "training exercises" all the time. Immediate Response was a training event we conducted with Georgia, in Georgia. This year it took place in early July. Such things usually last just a few weeks, as did this one. When we go on such training events we usually travel pretty light. In this case, they had basic gear -- some tents, a few Humvees, a couple of generators, and not much more. That sort of stuff still takes up a fair amount of space, though, so it's most efficient if you can send it in (and take it out) by ship. That is what happened this time as well. Well, the "send it in" part, anyway. When the training was complete the Americans prepped their vehicles for shipment (stripping them of any sensitive gear), packed what they could not carry into a few steel shipping containers, and sent the lot of it over to the port at Poti, Georgia where it could be picked up by a cargo ship. Then they flew home. Of course, you know what happened next. In August, Georgia and Russia fought over South Ossetia, and Russia subsequently pushed deep into Georgian territory along multiple routes. Still, as you can see from this map, our stuff should have been safe in Poti, which is well away from either conflict zone within Georgia. Here's my take. After pouring over the news, the videos, the various accounts from news sources around the world, I've come to the conclusion that the Russian Army is a lot more messed up than even I thought they were before all of this happened. Breaking into containers and looting the contents, let alone grand theft auto, is not what a professional or disciplined force does in a conflict. Therefore, it seems to me that what actually happened, particularly in the case of the US gear that was prepped for commercial shipping, is that the Russians totally lost control over their own troops. Their soldiers were going wild and stealing everything they thought they could use or sell. We cannot tell if this loss of control was at the junior officer level, or the mid-grade officer level (probable), or perhaps even at the general officer level, but apparently their forces are so ill-disciplined, broke, and perhaps starving, that they will and did resort to looting under the least pretext. "The port's director of security, Vakhtang Chichradze, said there was little that Russian troops didn't steal, saying they hauled away chairs, light switches, radiators and even five U.S.-made military Humvees. "From the military port, they took armchairs, toilets - everything," he said." They took freakin' toilets? Whoa. You are pretty far down on Maslow's Hierarchy of Needs when you resort to stealing toilets. As seen from the Intel Dump. If this is true, the Russian army couldn't stand up to any first rate army...or second rate or moderately numerous third rate army. The Georgians merely lost their war because of numbers...not anything else. really nothing else. How long before Russia irritates some nation that's less ... restrained than the West? The NERSC-6 RFP has been approved by DOE/SC for release and publication on this Web site on September 4, 2008. Interested Offerors are advised to discard all preceding draft RFP documents that were published on this Web site prior to September 4, 2008. Interested Offerors are advised to base their proposal responses on RFP documents now available on this Web site and any subsequent RFP amendments. Interested Offerors must submit all communication (questions, comments, etc.) about the NERSC-6 RFP to nersc6@nersc.gov. The NERSC-6 market discussion phase is complete; therefore, interested Offerors are no longer permitted direct communication with the NERSC-6 technical community except for regular business activities that do not pertain to the NERSC-6 RFP or as otherwise directed by the LBNL Subcontracts Manager. Interested Offerors are advised to monitor this Web site for potential NERSC-6 RFP amendments and other NERSC-6 RFP information updates. LBNL may notify interested Offerors (who have previously contacted LBNL and expressed an interest in the NERSC-6 RFP) of updated NERSC-6 RFP information via e-mail; however, LBNL is under no obligation to do so. It is the responsibility of all interested Offerors to monitor this Web site for current NERSC-6 RFP information. We are getting set for our next big machine (NERSC-6). It's gonna be a doozie. To help out our would-be vendors, we have also released the benchmarks we want run on as proof that their big iron is even close to good enough for we technosnobs/predators. Remember, NERSC is pathologically tough customer. Don't even dream of bidding on something like this unless you have an army and a deep, deep source of funds. However, if you want to vastly improve your product line, come to us, my pretties! When the world's land was congealed in one supercontinent 240 million years ago, Antarctica wasn't the forbiddingly icy place it is now. But paleontologists have found a previously unknown amphibious predator species that probably still made it less than hospitable. The species, named Kryostega collinsoni, is a temnospondyl, a prehistoric amphibian distantly related to modern salamanders and frogs. K. collinsoni resembled a modern crocodile, and probably was about 15 feet in length with a long and wide skull even flatter than a crocodile's. In addition to large upper and lower teeth at the edge of the mouth, temnospondyls often had tiny teeth on the roof of the palate. However, fossil evidence shows the teeth on the roof of the mouth of the newly found species were probably as large as those at the edge of the mouth. "Its teeth, compared to other amphibians, were just enormous. It leads us to believe this animal was a predator taking down large prey," said Christian Sidor, a University of Washington associate professor of biology and curator of vertebrate paleontology at the Burke Museum of Natural History and Culture at the UW. Sidor is lead author of a paper describing the new species published in the September issue of the Journal of Vertebrate Paleontology. Co-authors are Ross Damiani of Staatliches Museum für Naturkunde Stuttgart in Germany and William Hammer of Augustana College in Rock Island, Ill. The work was funded in part by the National Science Foundation and the Alexander von Humboldt Foundation. 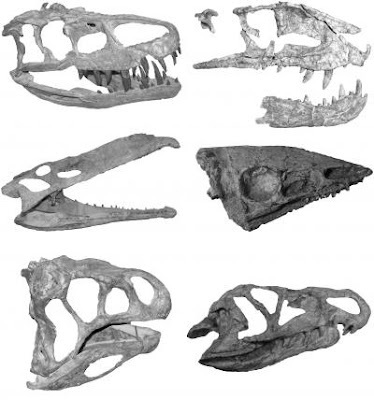 The scientists worked from a fossilized piece of the snout of K. collinsoni, analyzing structures present in more complete skulls for other temnospondyl species that had similar size characteristics. "The anatomy of the snout tells us what major group of amphibian this fossil belonged to," Sidor said. eeth at the edge of the mouth, as well as on the palate roof, were clearly visible, and the presence of structures similar to those that allow fish and amphibians to sense changes in water pressure led the researchers to conclude that the species was aquatic. 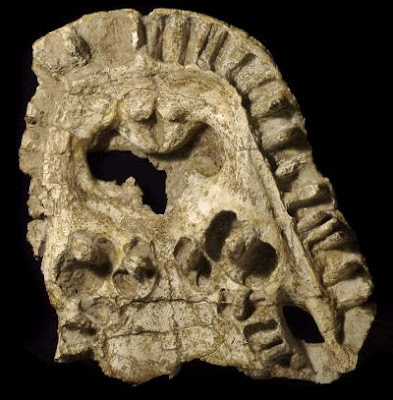 The fossilized piece of snout also contains a nostril, which aided the scientists in judging proportions of the head when comparing it to other fossils. They estimated the skull was about 2.75 feet long and perhaps 2 feet across at its widest point. 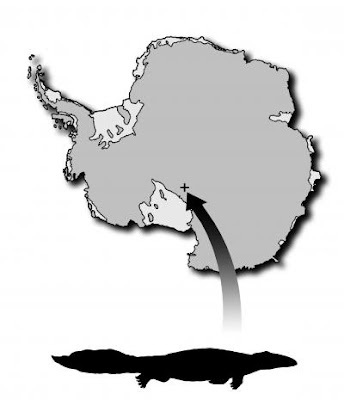 "Kryostega was the largest animal in Antarctica during the Triassic," Sidor said. National Geographic has more too. Russia, land of the the bear, Moscow, and vodka, the world's largest country (by land area) and a land that was once so full of potential after the fall of the Soviet Union. Potential that has been squandered. I have written about it before. I am sure I will write about it in the future. Right now, Russia is facing some serious problems. Immediate problems. However, their air force was of more concern. They used their top of the line aircraft. They used their A team pilots: the ones they use for instructors. Yet, unlike the Israelis that just flew in and out of Syria recently blowing up a purported nuclear reactor without losing a single aircraft. 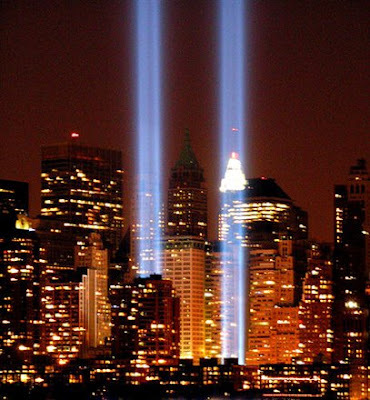 The missiles the Israelis faced were better. Supposedly, the Israelis used modern electronic warfare and info warfare to hack and disable everything they came across. Yet, teh Russians seem to have been unable to do the same thing. They lost a supposed 10 planes against a pipsqueek power. 10! What would they do against a second rate power? I don't even want to think about what would happen if they took on the US. The executive board of the Asian Development Bank, representing countries from Japan and China to Turkmenistan and Uzbekistan, unanimously approved a $40 million loan to Georgia at the lowest possible interest rate on Friday, the latest sign of Asian dissatisfaction with Russian military action there. 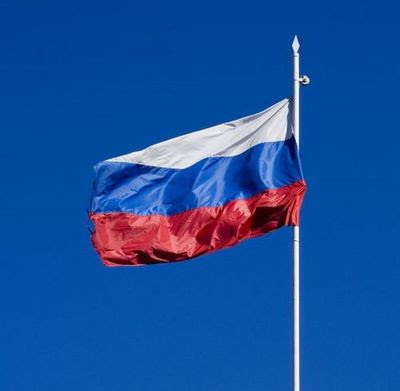 Juan Miranda, director general of the bank's Central and West Asia Department, said that the loan had been scheduled for board consideration on Friday before Russian troops moved into Georgia a month ago. But the Russian military action strengthened support at the bank for helping Georgia, he said. The 32-year loan carries an interest rate of just 1 percent for the first eight years and 1.5 percent for the remainder of the loan, making it a soft loan on preferential terms. The loan was so popular with the 12-member board that if the loan had not already been on the most generous terms available from the bank, "we would have softened it," Miranda said. The bank is also studying the possibility of making an emergency loan to Georgia to help it cope with budget problems after the brief war with Russia. "The month of August was not a very good month for tax collection," in Georgia, Miranda said. From here. Wow. Best possible terms from the countries that are supposed to be friendly with the Russians and with whom the Russians sought diplomatic backing from then balked. Then there's the economic front. Noel Maurer points out that there has been a meltdown underway for some time there even before the war and continued afterwards. Now there's a news story about how the Russian banking system is now facing a liquidity crunch. Then there's the news that oil prices are falling (just over $100 barrel) which is the major source of foreign cash flow into Russia and Russian oil production is falling too (.5% this year). Then there's demographics in Russia...oy. It's plausible that in 2030 we're looking at a 85 million person Russia. From a 140 million population of today. huh. Russia's in trouble. Short and long term. I wonder if its adventurism is merely an attempt to convince themselves they are important. Something of a mid life crisis...just before its starts to really wither and age...ungracefully. Brian and National Geographic have good articles on Georgiacetus, an archaeocetan. The Lake Tanganyika area, in southeast Africa, is home to nearly 130 million people living in four countries that bound the lake, the second deepest on Earth. Scientists have known that the region experiences dramatic wet and dry spells, and that rainfall profoundly affects the area's people, who depend on it for agriculture, drinking water and hydroelectric power. Scientists thought they knew what caused those rains: a season-following belt of clouds along the equator known as the Intertropical Convergence Zone (ITCZ). Specifically, they believed the ITCZ and rainfall and temperature patterns in the Lake Tanganyika area marched more or less in lockstep. When the ITCZ moved north of the equator during the northern summer, the heat (and moisture) would follow, depriving southeast Africa of moisture and rainfall. When the ITCZ moved south of the equator during the northern winter, the moisture followed, and southeast Africa got rain. Now a Brown-led research team has discovered the ITCZ may not be the key to southeast Africa's climate after all. Examining data from core sediments taken from Lake Tanganyika covering the last 60,000 years, the researchers report in this week's Science Express that the region's climate instead appears to be linked with ocean and atmospheric patterns in the Northern Hemisphere. The finding underscores the interconnectedness of the Earth's climate — how weather in one part of the planet can affect local conditions half a world away. The discovery also could help scientists understand how tropical Africa will respond to global warming, said Jessica Tierney, a graduate student in Brown's Geological Sciences Department and the paper's lead author. "It just implies the sensitivity of rainfall in eastern Africa is really high," Tierney said. "It doesn't really take much to tip it." The researchers, including James Russell and Yongsong Huang of Brown's Department of Geological Sciences faculty and scientists at the University of Arizona and the Royal Netherlands Institute for Sea Research, identified several time periods in which rainfall and temperature in southeast Africa did not correspond with the ITCZ's location. One such period was the early Holocene, extending roughly from 11,000 years ago to 6,000 years ago, in which the ITCZ's location north of the equator would have meant that tropical Africa would have been relatively dry. Instead, the team's core samples showed the region had been wet. Two other notable periods — about 34,000 years ago and about 58,000 years ago — showed similar discrepancies, the scientists reported. In addition, the team found climatic changes that occurred during stadials (cold snaps that occur during glacial periods), such as during the Younger Dryas, suddenly swung rainfall patterns in southeast Africa. Some of those swings occurred in less than 300 years, the team reported. "That's really fast," Tierney noted, adding it shows precipitation in the region is "jumpy" and could react abruptly to changes wrought by global warming. While the scientists concluded the ITCZ is not the dominant player in shaping tropical African climate, they say more research is needed to determine what drives rainfall and temperature patterns there. They suspect that a combination of winter winds in northern Asia and sea surface temperatures in the Indian Ocean have something to do with it. Under this scenario, the winds emanating from Asia would pick up moisture from the Indian Ocean as they swept southward toward tropical Africa. The warmer the waters the winds passed over, the more moisture would be gathered, and thus, more rain would fall in southeast Africa. The theory would help explain the dry conditions in southeast Africa during the stadials, Tierney and Russell said, because Indian Ocean surface temperatures would be cooler, and less moisture would be picked up by the prevailing winds. "What happens in southeast Africa appears to be really sensitive to the Indian Ocean's climate," Russell said. Africa's fate looks bleak under the coming gloval climate change. Really, really bleak. Dinosaurs Lucky? Not Tougher? Not Fitter? But Steve Brusatte, a doctoral student at Columbia University who is an affiliate of the American Museum of Natural History, and colleagues are challenging this idea with new fossil data and math. By comparing early dinosaurs to their competitors, the crurotarsan ancestors to crocodiles, they have found that dinosaurs were not "superior," as has long been thought. Rather, crurotarsans were the more successful group during the 30 million years they overlapped until the devastating mass extinction 200 million years ago, an event that dinosaurs weathered successfully. Both dinosaurs and crurotarsans evolved and filled some of the same niches after a massive extinction event that occurred at the end of the Permian (250 million years ago). Of the crurotarsan group, crocodilians are the only living members. But in the Triassic, crurotarsans were amazingly diverse—from giant carnivorous rauisuchians to long–snouted, flesh eating phytosaurs to herbivorous armored aetosaurs—and they have often been mistaken for dinosaurs in the fossil record, the animals that they probably competed with for the same resources. Both groups survived an extinction event 228 million years ago, but only a few crurotarsans—the crocodiles—squeaked through a period of rapid global warming at the end of the Triassic 200 million years ago. Dinosaurs faired better during the latter extinction: most types of dinosaurs survived until an asteroid ended their dominance 65 million years ago. It is because of this stroke of luck that dinosaurs were assumed to be the better competitors. There's a second press release here. National Geographic covers it here. Our own faunal group in the blogosphere has Chinleana's post as well. I have to wonder about this. We're starting to see a lot more smear for what we thought were originally very delineated faunal groups. As we are finding, this is turning out to be less and less true. Critters we thought went extinct by certain time frames seem to have merely retreated to refugia (*cough* dicynodonts *cough*) or just were not in the local area that we were finding fossils from. Because we have so few locales that are rendering up fossils, I fear that we are drawing great and profound conclusions from so very little data. It may be that the the Permian Extinction in the terrestrial realm may be ratched down as far as the magnitude is concerned simply if another terrestrial site is discovered had less radical faunal transitions simply because, iirc, we have something on the order of three, yes, three locations that we are drawing such vast conclusions about for the PT Extinction. Something similar is happening for the TJ Extinction and other lesser ones. Tread carefully, folks. Small sample sizes make fools of the best. Obviously with all the events that have been swirling around me like some sort of fascinating if exciting and terrifying vortex, I have not ahd much chance to read at all. In fact, my reading has fallen to a glacial pace. You try fund raising for and building a rocket, run Crays and other HPC assets, and still take care of a family while getting in lots of quality time with the pages! Even so, I was able to chew my way through some juicy books. The first one I mentioned before, Paleoecology by Allmon et al, had gobs of interesting stuff in it. There were a few conclusions from the Caribbean paleoreef studies that are still making me go hmmm: the less nutrients there are the MORE biodiversity a reef ecosystem s! Other appears were stuff I have latched onto as an ah-ha! 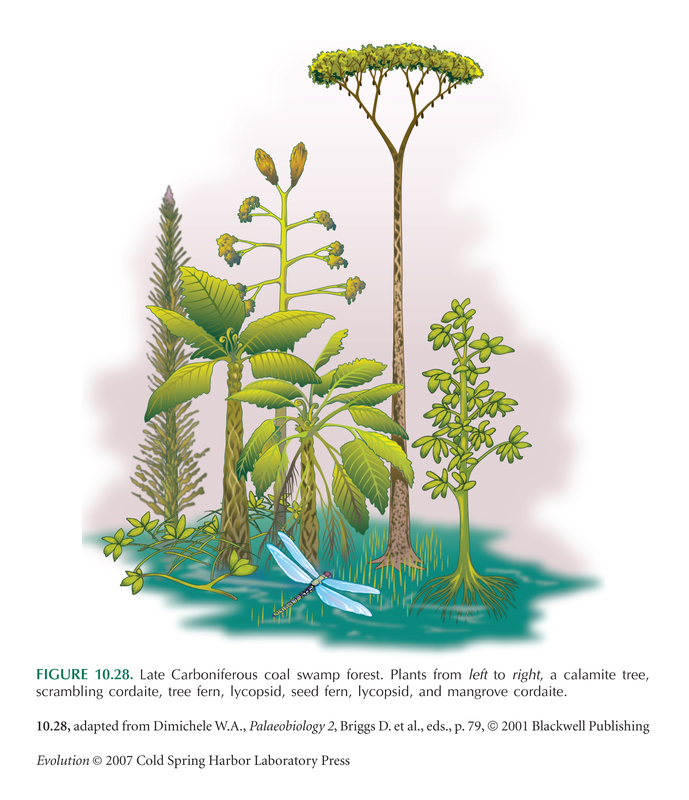 moments to form the basis of the ecology in the age of carbon post and an upcoming one on the phytoaspect of the Paleozoic caste ecology (love the phrase, Carlos!). The second book I completed was a paleo themed one as well: Amniote Paleobiology. There are some wonderful papers in there. However, my skeletal morphology is not up to spec for some of them: Sereno discusses the very unique posture of the multituberculates and there was a very indepth discussion of their very unique scapula and how it tied into their posture. OTOH, there were some papers that I got sucked into pretty thoroughly: the ones about just how many species of Lystrosaurus are there and when did endothermy arise in the nonmammalian therapsids were two of these. The book covered dinosaurs, birds, reptiles, mammalians, therapsids, etc. My one disappointment, though, was that there was zilch on the basal amniotes, iirc, which was what I picked the book up for. I also picked up the nifty art book of Dawn of the Dinosaurs. 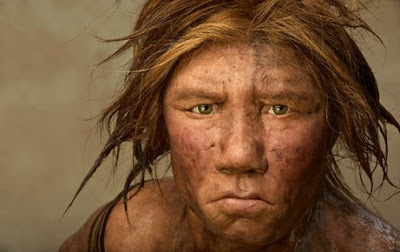 Then I shifted out of the paleo realm and into historical one. I have been feeling a bit of that old Byzantinophilia cropping up again. So I picked up the atypically thesised Byzantium and the Crusades. The basic premise for the book was toe explain how the 4th Crusade came about, y'know, the one where the Crusaders instead of attacking Muslim Egypt conquered (and effective brought low, permanently) the Christian Byzantine Empire. His thesis was that Byzantine misunderstanding of the West and the Weest's misunderstanding of the Eastern Romans/Byzantines/Greeks was an explosive that was just waiting for the fuse to be lit. That fuse set off everything was not bribes or greed or what have you, but traditional Byzantine diplomacy. It was interesting. I need to learn more before I can say yea or nay to the idea though. I find it plausible at least. Flipping to the modern era, I have been plugging along in Mexico by Enrique Krauze. When I'm done with this, I think I'll have enough base knowledge to finally be able to read Noel's books. They're next on my Mexican historical tour. Oh, and I also read Pushing Ice by Alastair Reynolds in the book store. My daughter loves playing in the kids area and my wife likes the shopping oustide, soooo...I found it...ok.
Anyways, so that's what I finished. I know, I know...I am a slacker.